Do the New York state courts believe in ghosts? That’s the question The Legal Genealogist has to consider now that the case of Stambovsky v. Ackley has crossed this blog-writer’s radar. Now don’t go off the rails here, folks. I know very well that what the good judge was really saying was that the seller of the house couldn’t have it both ways: the seller couldn’t make a buck by telling the locals the house was haunted and then turn around and not tell the buyer about the reputation the sellers had been building up for the house. So it really is a legally defensible — and quite reasonable — decision. Happily, you love court records. Similarly, we are happy to be able to tap into that as you share them. The judge found that the seller’s failure to disclose was grounds for recision but dismissed the case anyway. Why? I was wondering the same thing. My second question is why the buyer’s real estate agent didn’t bring is up! Of course, if he didn’t use one then it’s entirely up to him to do his due diligence, along with the seller’s responsibility to disclose. Of course, we’re also talking 1991 and New York, where common sense doesn’t always seem to have any place in the laws! Again, sorry: two different courts. The court that dismissed was the trial court; this court (an appellate court) reinstated the case against the seller. Two different courts: the Supreme Court was the trial court, and that’s the court that dismissed the action. This opinion is by the Supreme Court Appellate Division — a higher court — and it reversed as against the seller (leaving the dismissal alone as against the real estate broker). Laugh if you will, but the presence of a ghost is one of the questions I submitted to the seller of the 100-year-old farmhouse we were considering purchasing! Too soon. This should have been on Halloween. 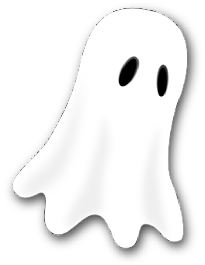 We all love good legal ghost stories by our Legal Genealogist! You do have a knack for finding the legal story with an unusual twist, Judy. BTW- my house is haunted, but by a cat, so it’s ok. If this case had been heard now, do you think the appellate court would have decided the same way? Thanks to the Internet, it is now much easier for a person to learn about the history of a house s/he is considering buying. I suspect a judge today would avoid the sentence that “as a matter of law, the house is haunted” in favor of a more nuanced statement that makes it clear that the defendant can’t have it both ways. And I agree that it’s much harder for a plaintiff today to establish that not only did he not know, but he had no reason to know. But if the proofs were in fact the same, yeah, I think the court would still have ruled the same way. It’s just that the chances are so small that the proofs could be the same today. And how often do you see the national publication Readers’ Digest cited in court rulings? A quick search in a computerized legal research database turns up 2511 results in both federal and state courts. When you take out references to cases in which Reader’s Digest was a defendant, there are 908. Fun case! Thanks for sharing it! I saw you speak at the New York State Family History Conference and enjoyed each one immensely. I also wanted to let you know that two of your posts are included in my NoteWorthy Reads #22: http://jahcmft.blogspot.com/2015/10/noteworthy-reads-22.html Enjoy your weekend!